Table linens turn an ordinary folding table into one of the highlights of your event’s theme. Create the perfect fairytale wedding with pastel colors and spectacular centerpieces. Design a dramatic tablescape with vibrant tablecloths, chair covers and coordinating napkins for Halloween parties and Mardi Gras balls. 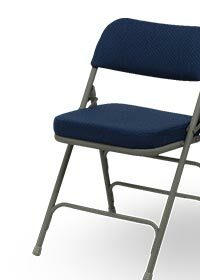 Keep your chairs in neat rows with ganging clips when you hold conferences and seminars. And when your business or social function is over, stack all those tables and chairs onto dollies and simply roll them away. Between events, protect your chairs with chair covers and waterproof storage bags. Plastic, Poly & Resin Ganging Clips, Vinyl Chair Covers and Waterproof Folding Chair Storage Bags, Dollies, Folding Bars, Linen.